"The DNA sequence is the same in a brain cell, a liver cell and a heart cell," said Jingyi "Jessica" Li , the study's corresponding author and a UCLA assistant professor of statistics. "Why do those cells look so different? The key thing is gene expression." DNA encodes the information needed to create and operate an organism. But the task of reading and acting on that information falls to RNA, long strands of mobile molecules that transport genetic instructions to other parts of a cell. By tallying the various RNA molecules in a cell, researchers can tell which genes are active — or "expressed" — and to what degree. However, if RNA molecules are present only in trace amounts, analysis tools can be fooled into thinking that the corresponding genes aren't active at all. Unless corrected for, these "dropouts" can paint a misleading picture about actual differences between cells. "If you want to obtain useful biological information at the individual cell level, then you need to do some statistical inferences," said Li, who is also head of the Junction of Statistics and Biology laboratory. "Otherwise your conclusions may be wrong." 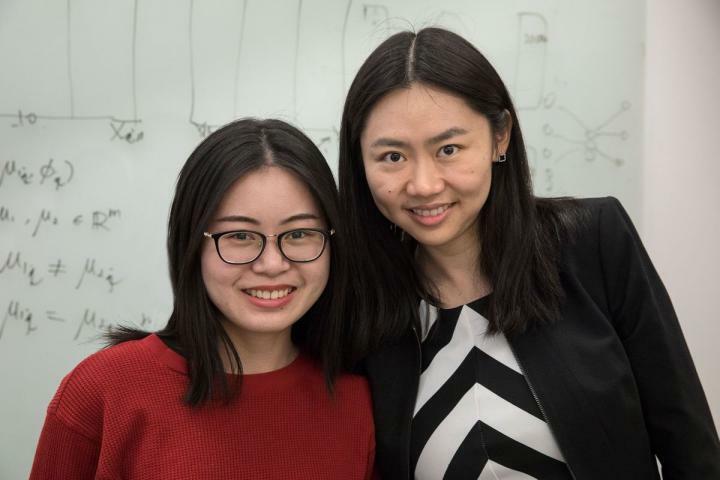 Li and Wei "Vivian" Li, a doctoral candidate in the UCLA department of statistics, have designed statistical analysis software for handling dropouts in RNA sequencing. Their tool, called "scImpute," estimates which genes in a cell are most likely to drop out based on studying all individual cells in an experiment. The tool then uses information from similar cells to make an educated guess about what the level of gene expression should be. Utilizing estimates isn't new. But available tools are either too broad — swapping out all gene expressions of one cell with another — or hyper-specialized for a particular type of study. The advantages of scImpute are "flexibility and universality," Jessica Li said. The tool acts with surgical precision to replace only abundances that have most likely dropped out and can be used in any type of single-cell gene-expression analysis. In Vivian Li's comprehensive tests on both simulated and actual data — some of which provide empirical evidence for actual levels of gene expression — scImpute is more accurate than other methods. The software reliably distinguishes dropout genes from those that aren't expressed at all, and it provides accurate estimates of the actual abundances. This research was supported by a PhRMA Foundation Research Starter Grant in Informatics, as well as grants from the National Science Foundation's Division of Mathematical Sciences and the National Institute of Health's National Institute of General Medical Sciences.